:As a forensic genealogist, Willow Anderson is following in her late grandfather's footsteps in her quest for answers about a baby abducted from the hospital more than twenty years ago. The case may be cold, but things are about to heat up when someone makes an attempt on her life to keep her from discovering the truth. 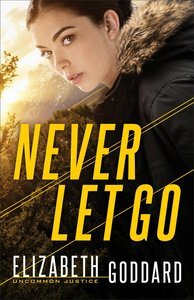 About "Never Let Go (#01 in Uncommon Justice Series)"
Elizabeth Goddard is the author of several novels and novellas. A 7th generation Texan surrounded by Christian family and friends,nbsp;she grew up in a small oil town in East Texas. Fueld by a strong faith and her love of reading, Elizabeth naturally began writing Christian fiction. Shenbsp;is an active member of several writing organizations and contributes to several blogs. You can read more about Elizabeth at Elizabethgoddard.com. Pre-Order now to secure your copy. Expected to ship December 2019.